It's not often that I would blog a bar or restaurant after one visit, but sometimes I find a place really worthy of a mention. Something a bit different. My wife likes to say that in Phuket it's hard to find somewhere unique and arty, although in Phuket Town over the last 5 years there have been some good restaurants, bars and cafes opening with a vibe of their own. In the tourist areas however, everything tends to look the same. Restaurants that do Thai food, pizza, pasta, burgers, seafood .. well, it can't all be good, can it? And bars in the main tourist zones rarely interest me. Especially Patong, which is an area of Phuket that I can happily never visit - the biggest, most developed stretch of beach in Thailand? Well, maybe Pattaya also, and Hua Hin is pretty busy, but Patong is tourism central for Phuket. I do often drive to or from work via Patong, but I keep to the back roads. The road furthest from the beach, up on the hillside is called Hasip Pee Road, and I usually go this way through Patong to avoid all the traffic, up over the mountain! Parts of this road are about 180m above sea level and there are some views over the bay of Patong. There's a little side road off Hasip Pee Road leading up to the Wassa Homemade Bar, and I had driven past this about 100 times before deciding to stop a couple of days ago. It used to have a different name, something like Suatalay Hangout Bar and I really meant to check it out for a long time. Glad I finally did! (above) View from the bar. You can sit at the bar or at various tables / bar stools around the area on several levels. I ordered a small Chang beer (90 Baht). There is food also, but I was just here for a quick beer (or 2) on the way home. Just a "see if I like it" visit - the answer is YES, I like it! I chatted briefly with the owner, a Phuket local called Pui. 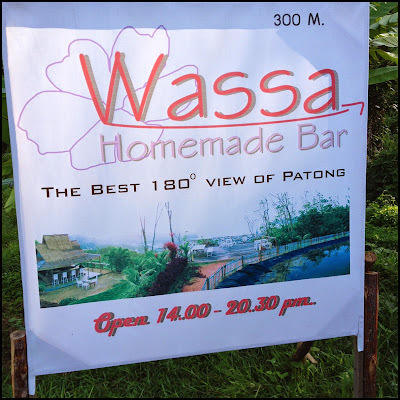 He was one of the partners in the Suatalay Hangout, but when the other partner left, he renamed the bar and is now building his house next door! Next to the bar, if you walk up a few steps is a platform with a few tables and chairs and yes, just about the best view of Patong. Looks so small and quiet from up here. I think the bar must be about 200m above the sea. (above) So I walked up to the higher platform .... There are also seats in front of the main bar, a grandstand sunset view! If you stay in Patong and think that a trip to the famous After Beach Bar south of Kata beach is too far - here's the answer! After a long hot day in the dive shop I downed my Chang rather fast, so had to order one more while snapping photos of the sunset. More than 2 small bottles and driving down that steep hill might be scary! I am sure that if you do have too much, Pui can call you a taxi! For me this is an ideal sunset bar, a couple of beers, a great view, some quiet music playing in the background. There were only about a dozen people at the bar when I stopped. It does take some effort to get there! 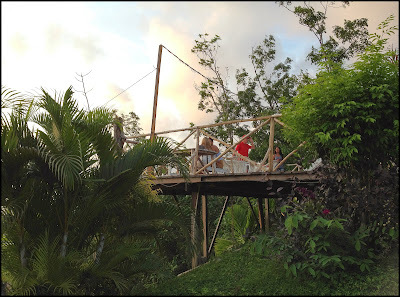 (above) The sunset view from the balcony at Wassa Homemade Bar. I like sunsets, I like quiet, I like views and I like a cold beer. Win! You can see just about all of Patong from here, it's a 180 degree view. Phuket is all about hills, there are so many great views around the island. 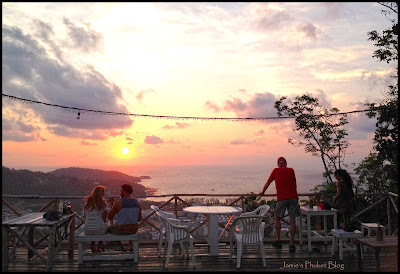 The name Phuket is derived from the Malay word "Bukit" which means ... HILL. I do urge you to get up some hills when visiting Phuket - more info on the blog here : Phuket Hills and Viewpoints. (above) An attempt to capture a 180 degree panorama view with the iPhone from the Wassa Homemade Bar. Yeh, I am lacking a decent camera at the moment, so all photos on this page are iPhone photos. Not bad, though! I was very happy to stop here for a short / 2 beer visit. And since I pass this way most days .... it could be a regular off-gassing stop! You can find it on Facebook. 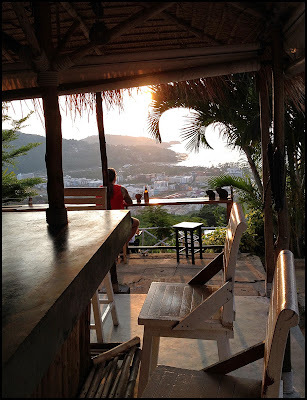 Nice to find an original, interesting bar in Patong (well, not IN Patong, but above Patong) and the view is just about unbeatable.